A mea culpa: I've been incredibly tardy on announcing the winner of the draw for all seven Ngaio Marsh Award longlisted books. 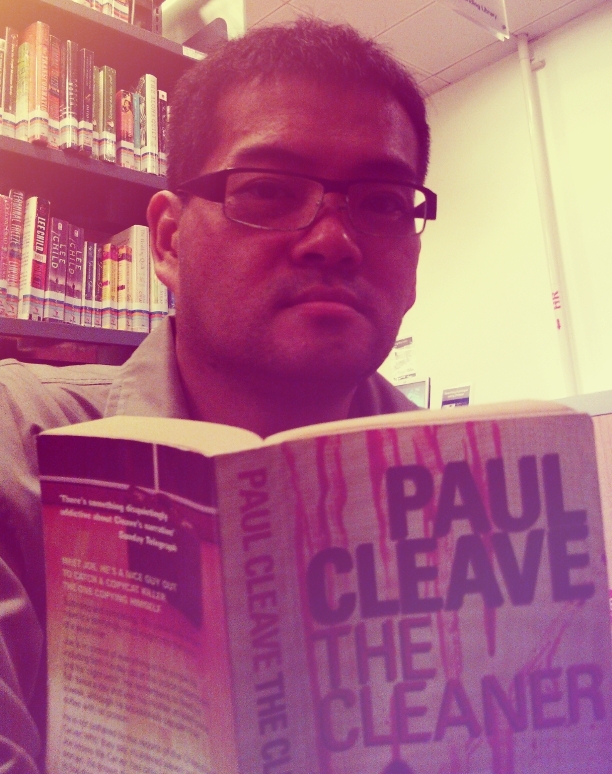 The lucky keen crime reader is Michael Chin from Singapore (pictured right with a copy of Paul Cleave's debut THE CLEANER - an Australian edition by the looks). Congratulations to Michael - who was informed of his win last month, shortly after the presentation of the 2012 Ngaio Marsh Award for Best Crime Novel to Neil Cross at the Christchurch Writers Festival (I've just been slack at informing everyone else, sorry - as you may have gathered from the lack of recent posts, there's a lot going on here). Michael will now get a chance to try Cross's award-winning 'Luther' novel for himself, along with more excellent crime novels from Cleave, Vanda Symon, Ben Sanders, Paddy Richardson, Jack Eden, and Ian Wedde. 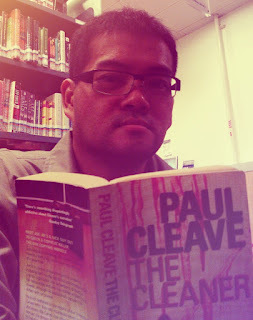 From the looks of Michael's bookshelf in the photo background, he's certainly a keen crime reader - so I hope he enjoys a greater taste of Kiwi crime fiction! Thanks to everyone who entered this year's contest. I really appreciate all the comments and feedback. Congratulation to the winner. Thanks for keeping us posted Craig.